The uncertainty that lies below the surface of the sea provides a number of industries with incredible challenges when conducting their daily business. From offshore structure installation and inspection, to the defense of our ports, and construction of national power generation assets, all subsea industries are plagued with a dynamic set of problems they must address. The industry standard technology that is utilized for underwater inspection is the multibeam sonar which was introduced in the market around 20 years ago. The multibeam at the point of its introduction to the market was revolutionary because it could generate clearer images of the underwater environment than the pre-cursor technology, the single beam. 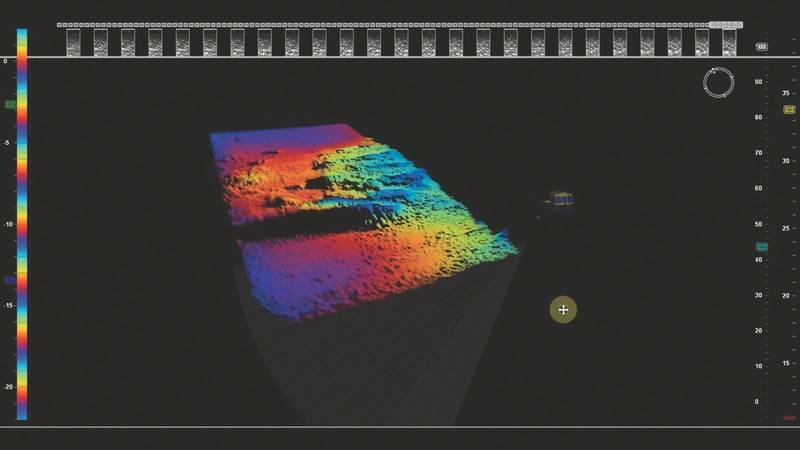 The multibeam however has limitations as its outputs require post processing to render useful 3D images of the area being inspected and cannot image moving objects. Many subsea applications require technology that can facilitate real-time 3D decision making of both static and dynamic operations. Coda Octopus Products Ltd. has recognized this market requirement and has been at the forefront of marine survey operations for nearly 25 years. The company started as the first pioneer of digital acquisition and processing for geophysical survey, and this innovation and emphasis on research and development (R&D) has characterized the company ever since. Coda Octopus has continued to lead the geophysical acquisition and processing market with its GeoSurvey, DA and Survey Engine product ranges. In addition it has developed a unique range of patented real-time 3D volumetric sonar systems marketed under the brand name of Echoscope and are leaders in real-time 3D visualization subsea. This world first technology allows the user to generate a real-time 3D image of the underwater environment regardless if low or zero visibility conditions prevail and has been successfully used on a wide variety of complex subsea projects and operations across the globe including in oil and gas applications, breakwater construction, asset placements and landings, port and harbor security, defense, mining and diving applications Our real-time 3D and geophysical product ranges are complemented by GNSS aided inertial navigation systems. The F180 series has a proven track record in the marine survey industry for accuracy and reliability and is a preferred asset found on survey vessels across the world. Our existing third generation of real-time 3D sonar products includes the standard Echoscope, the Echoscope and Echoscope C500. All these variants have a standard depth rating of 600 meters and can be supplied with 3,000 meter ratings; we also have the capability to take these down to 6,000 meters on request. We continue to innovate and develop new application products within the real-time 3D sonar arena. Led by many years of experience in the subsea market coupled with feedback from our customers, and directed by our R&D department, we never stand still. 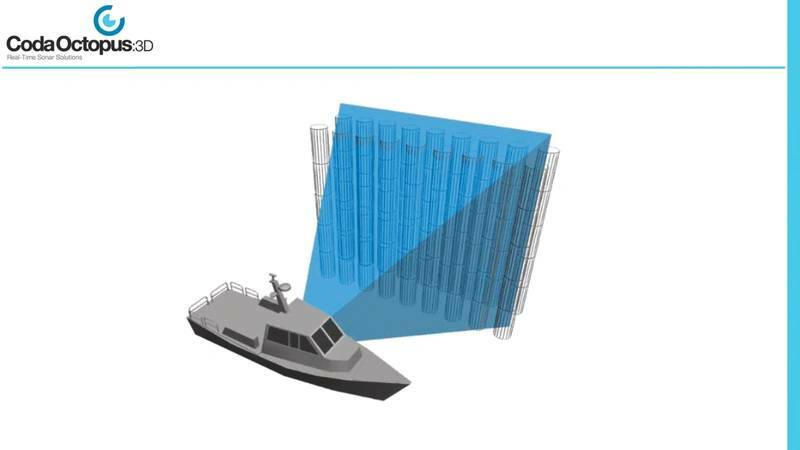 All of our real-time 3D sonars use a proprietary technology and remain the only true real-time 3D imaging sonar, transmitting a large volumetric pulse of sound energy which generates typically over 16,000 beams for every acoustic transmission or ‘ping’. We have made significant steps forward in innovating our fourth generation (4G) of these products and the company is launching the new Echoscope4G Surface sonar in January 2018. The reimagined, reengineered and repackaged Echoscope4G Surface comes in a new form factor and is 50 percent lighter, 40 percent smaller and draws 30 percent less power than our third generation (3G) of technology. Following feedback from our customers and a clear understanding of the key applications and environments in which they use our unique technology – the Surface enters a new distinct market space for shallow water system operation. Our standard Echoscope entry product is 600m rated making it at home on ROV, AUVs and vessels alike. In developing the Echoscope4G Surface we focussed specifically on shallow water operational needs and were able to dramatically reduce the key size, weight and power (SWaP) characteristics of the system. This new Surface product is designed for underwater operations not exceeding 20m water depth. The new Surface is also more a plug-and-play application as it requires less tuning than our existing Echoscope. Benefits of the Surface for shallow water applications and small platform operations are huge, all without compromise on image fidelity and performance or capability. 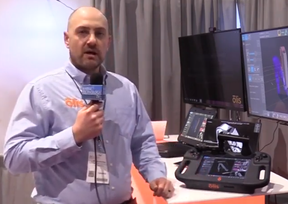 The Echoscope4G Surface generates true real-time 3D images and mapping as the larger Echoscope. The Echoscope technology has now developed such that offers unparalleled application, versatility and performance. This includes, simultaneous imaging and mapping and generation of survey grade mosaics and bathymetry of subsea areas without any post-processing and visualization of both static and moving objects. With the recent introduction of our XD model and capability – we now provide wide swath volumetric mapping over and above the real-time 3D camera imaging and high resolution 3D real-time inspection we are widely acclaimed for. This unique capability gives users many benefits, including ‘eyes’ underwater where water visibility is poor, the ability to visualize in 3D moving objects so precise control of dynamic operations is possible, the ability to instantly visualize complex structures and the ability to generate survey grade bathymetric data without post-processing. The Echoscope range of sonars use proprietary techniques to transmit and receive a large volumetric pulse of sound energy up to 12 times per second. This volumetric pulse which is typically 50⁰ x 50⁰ at 375kHz is then subsequently detected by the receive array, which segments each return into over 16,000 soundings for every ping. This exceptionally high data density in the water column enables the USE software to instantaneously render a 3D image on the topsides PC or laptop. In addition to real-time 3D visualization of static objects, the volumetric pulse generates a large Field of View (FoV) which enables any moving object within the FoV to be constantly visible. This will remain true even in waters where the visibility is low, preventing the use of subsea cameras. Further, the angle of the volumetric beam, enables enhanced imaging of complex objects and structures to be rapidly generated, with significantly less acoustic shadowing compared to a standard multibeam set-up and without any post-processing. The image below is of a vessel loading pier in Tianjin Harbour in China, and was captured using an Echoscope XD, used in conjunction with our 1-box F185 GPS and Motion system. 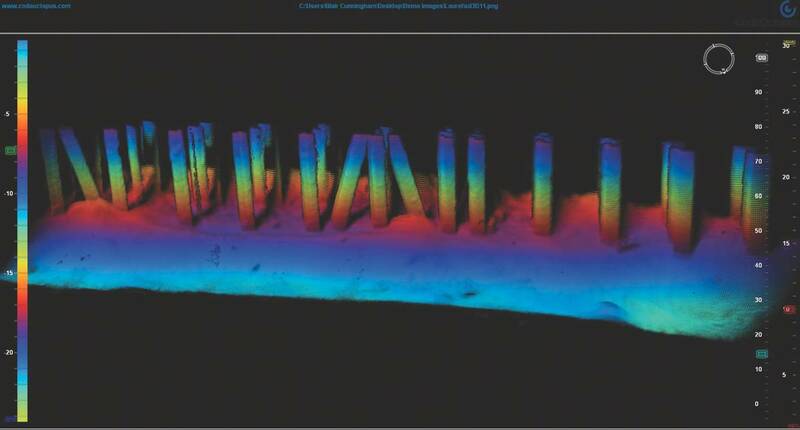 The images below were generated in a single pass of the survey vessel, without any post-processing of the data required and significant detail around the piles is clearly visible. The patented Echoscope range of real-time sonars are more than visualization tools, as they enable the capture of hydrographic quality data in real-time from the same sensor. This enables an operator to use the sonar for a multitude of purposes, such as visualization of a valuable asset as it is accurately placed on the seabed, and then simultaneously using this data to provide the as-built or as-laid survey. The range of real-time 3D sonars are now differentiated by the depth rating, the frequencies and resolution available. The highest performance system, the Echoscope XD, is supplied with both a wide angle 90⁰ x 44⁰ 240kHz projector, and a multi-frequency 55⁰ x55⁰ to 20⁰ x 20⁰ projector offering eight different frequency settings from 340 to 700kHz. This system gives the operator the widest range of flexibility with a broad range of frequency, opening angles and resolution available for wide angle mapping, visualization and surveying. The Standard Echoscope can be supplied in either a dual-frequency or a multi-frequency configuration, and the compact C500 in a lower resolution dual-frequency configuration. 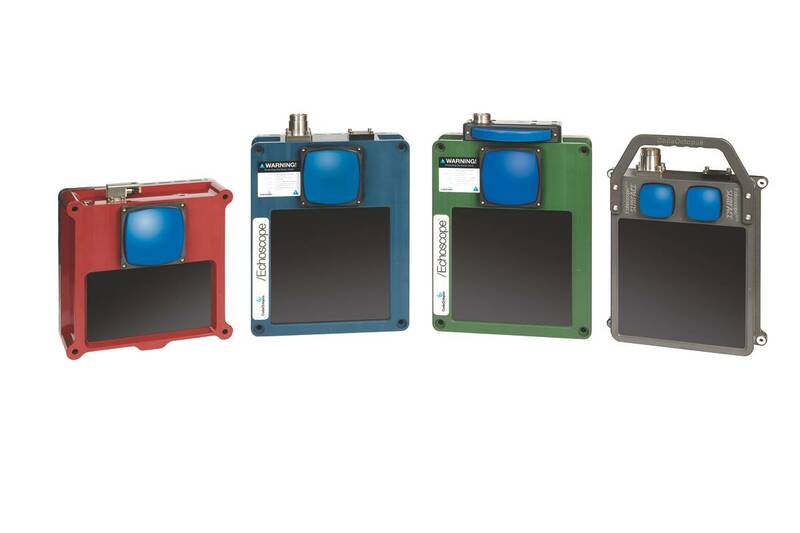 The new Echoscope4G Surface is available in either single, dual and triple frequency models offering unique combinations of frequency at 240, 375 and 630 kHz and opening angles of 90⁰ x 44⁰, 50⁰ x 50⁰ to 24⁰ x 24⁰. This combination of frequencies and opening angles give the new Echoscope4G Surface a unique set of capabilities which can be deployed in a range of operations and tasks. The new Echoscope4G Surface features our latest signal processing technology, which changes how the software processes data, making the system more intuitive and simpler than ever to operate, making it more of a ‘plug and play’ system. The range of real-time 3D sonars is complemented by the different software applications. The standard USE software will operate with all of our sonar systems. USE offers additional features to enhance operations including the ability to insert geo-referenced models to enhance and visually augment the acoustic sonar data, the ability operate with and without GNSS position and motion data and the ability to export raw or binned point-cloud data for processing in third-party hydrographic software. We have further developed our proprietary visualization software to add the ability to track targets for the breakwater construction market and our construction specific software CMS. This unique software enables both the visualization of large concrete blocks as they are placed in the water, and also automatically tracks and overlays a 3D model of the block to assist the operator with accurate placement of the block. Our software also records the as laid x,y,z position and the orientation of each block, building up a 3D model of the constructed breakwater. The versatility of the sonar/hardware combination has been further demonstrated by our customers using the same Echoscope as used for visualization of the installation, being used to carry out the complete as-laid survey, a method which has now been accepted and validated by the block design consultants. With the ability to both visualize and map data and image moving objects in 3D under the water in low or zero visibility conditions, our range of sonars have a huge and important number of different markets and applications across the world. One of our key markets has been subsea construction, either through imaging and survey of dredging and construction sites, ROV based oil and gas projects for key infrastructure installation through to installation of structures including breakwater construction. The ability to ‘see’ what is happening under the water can significantly improve the efficiency of the operation enabling operators to increase the speed and safety of the process. The new Echoscope4G Surface has been designed with these type of shallow water construction project in mind, offering a cost effective route to delivery these types of projects. The new Surface system can be used with both our proprietary software packages, USE and CMS software, giving the options of deployment on cranes, barges or survey vessels to image and map breakwaters, inshore bridges, piers and complex structures providing real-time assessment the accuracy of the asset placement, any damage to the structure and the effects of any environmental condition such as scour. A number of our customers have reported significant productivity gains when using real-time 3D technology included in offshore wind energy projects. These have included recent cable installation projects such as Race Bank inter-array installation with DeepOcean. 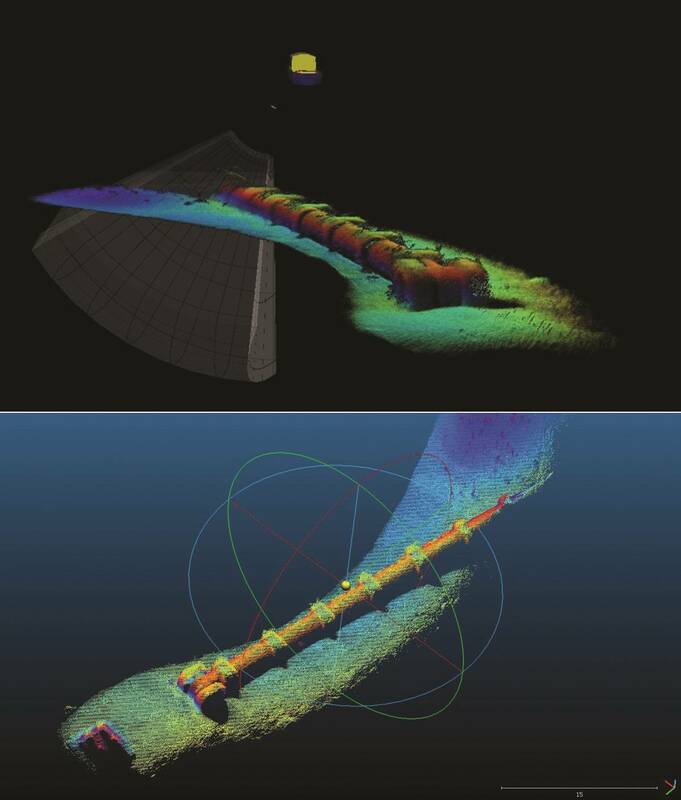 In this project the real-time 3D output was invaluable in being able to both image the power cable as it was laid to ensure none of the vital cable properties were exceeded and additionally to record the as-laid position of the cable on the sea bed as the cable was installed. This removed any requirement for a subsequent multibeam survey of the cable and the recorded as-laid position was then utilized by the trenching team to guide the cable trenching operations. The ability to visualise what was happening under the water, irrespective of poor water visibility, reduced the reliance on ROVs to support the project and the number of tasks carried out by the real-time 3D system rapidly increased as the project progressed. Our breakwater customers, such as SGTM-STFA and Van Oord have also reported significant project success using the Echoscope. This has included operation by Van Oord on the Kuwait National Petroleum Company project to construct a port and breakwater. The breakwater was armoured with 24,000 Core-LocTM concrete blocks and the Echoscope real-time 3D sonar was mounted on the installation excavator to provide imaging of each block. Productivity rates of up to 200 blocks per day were subsequently reported by Van Oord. 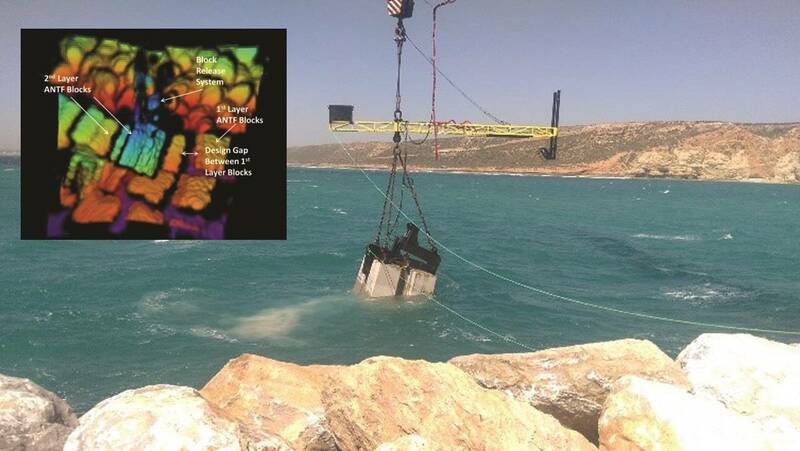 On the Port of Safi project, the operator SGTM-STFA installed three separate Echoscope systems on wire crawler cranes and by removing the requirement to use divers to monitor the blocks under the water, were able to work 24 hour shifts, thereby tripling the productivity rate on the site. The launch of the new Echoscope4G Surface is an important milestone for Coda Octopus and we continue to innovate our products with the aim of standardizing real-time 3D solutions in the subsea market – for various applications and different price points. 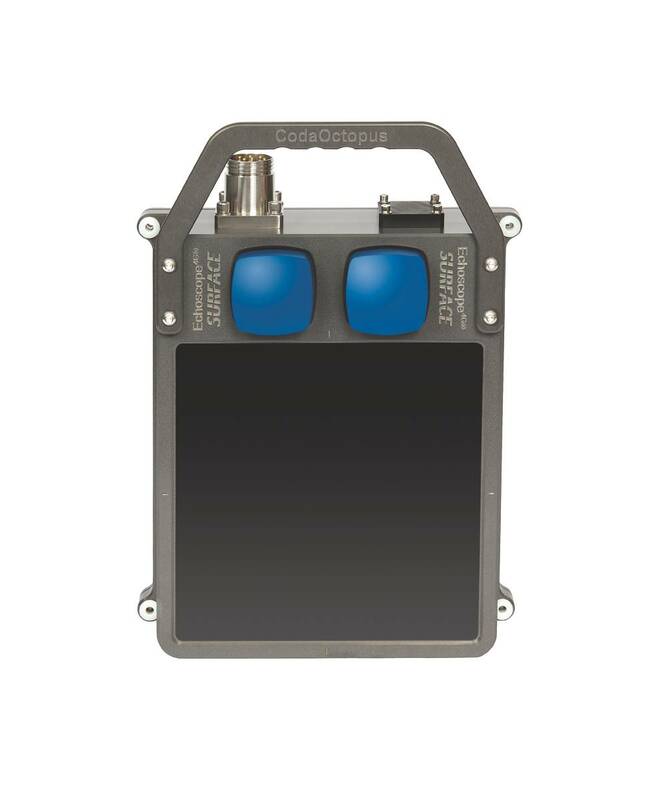 The unique volumetric pulse, the wide FoV and volume of data generated by this unique technology make it well suited to autonomous operation including autonomous assessment and identification and classification of unknown objects required by autonomous underwater and surface vehicles. The world of subsea engineering will always be a challenging one, but with the right approach, equipment and ability to visualize the operations in real-time and 3D, the challenges can be managed and reduced to acceptable levels. As a leader in real-time 3D acoustic imaging and mapping, the new Echoscope4G Surface is an example of how Coda Octopus will continue to innovate and develop both hardware and software to continue to be at the forefront of subsea engineering and survey operations. Richard Adams joined Coda Octopus Products Ltd. in 2014 and is now the Sales Director and looks after the European, African, and Asian markets.